*"As is, where is" basis and above information believed correct but without guarantee. 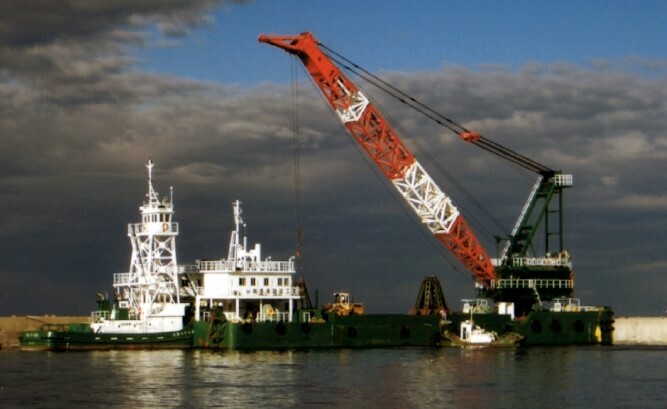 Unloading Pump Dredger for Sale Built Year/Place : 1994/Japan Flag : Korea Hull Dimensions(LxBxD) : 60.0 x 15.0 x 3.5 m GT : 881 Ton ..
8m3 GRAB DREDGER PRINCIPAL PARTICULARS Built year : 1992 Built place : Japan Class : BV (Suspended) Dimension (LxBxD) : 38.0 x 16.0 x 3.6 m GR..
Jack Up Barge for Charter Built Year/Place : 2013/Korea Flag : Panama Class : KR Barge Dimensions(LxBxD) : 42.0 x 24.0 x 3.8 m GT : 1,343&n..
180 Ton Floating Crane (Revolving Type) Built Year : 1981 Built Place : Japan Hull Dimensions(LxBxD) : 45.0 x 20.0 x 3.5 m Crane Mode..
7m3 Grab Dredger PRINCIPAL PARTICULARS Built Year : 1980 Built Place : Japan Dimension(L x B x D) : 30.72 x 14.40 x 2.80 m GRT : 270 Ton &..
680HP Tug Boat Built Year : 1988 Built Place : Japan Dimensions(LxBxD) : 12.57 x 5.50 x 1.96 m GT : 19 Ton Main Engine : 338PS(248KW) x ..
300 Ton Floating Crane Built Year : 1994 Built Place : Japan Hull Dimensions (LxBxD) : 48.02 x 23.00 x 4.25 m GT : 1,157 Tons L..
2,000 Ton Floating Crane Built Year : 2009 Built Place : Korea Class : KR Dimensions (LxBxD) : 81.63 x 42.0 x 7.0 m Lifting Capacity : 2,..
1,500 Ton Floating Crane Built Year : 2012 Built Place : Korea Class : KR Dimensions (LxBxD) : 79.7 x 34.0 x 6.0 m Lifting Capacity : 1,500 To..
300 Ton Floating Crane (Revolving Type) Built Year : 1997 Dimension(L x B x D) : 60.0 x 24.0 x 3.4 m DWeadweight : 2,500 Tons Crane Max. Lif..
13m3 Grab Dredger Built year : 1979 Dimension (LxBxD) : 48.01 x 20.0 x 3.6 m GRT : 769 Ton Crane type : DKG65LL Bucket : 13m3 Dredging Depth..
3,500m3 Split Hopper Barge Built Year : 1999 Built Place : Japan Dimension(LxBxD) : 86.21 x 18.00 x 6.20m GRT : 2,539Ton * "As is, Where is" ..
1,200Ton Floating Crane Built Year : 2010 Built Place : Korea Class : KR Dimensions(LxBxD) : 74.9 x 32.0 x 5.4 m Lifting Capacity : S.W.L ..